Special blend of polyester polymers that produces a tack-free, non-wax high gloss finish —with chemical resistance, high impact strength and excellent colour and light stability—for composite plugs and patterns and wood product surfaces. For composite plugs and patterns and wood product surfaces. Used by boat manufacturers as well as manufacturers of aircraft interiors, architectural woodwork, automotive wood dashboards, furniture and musical instruments. 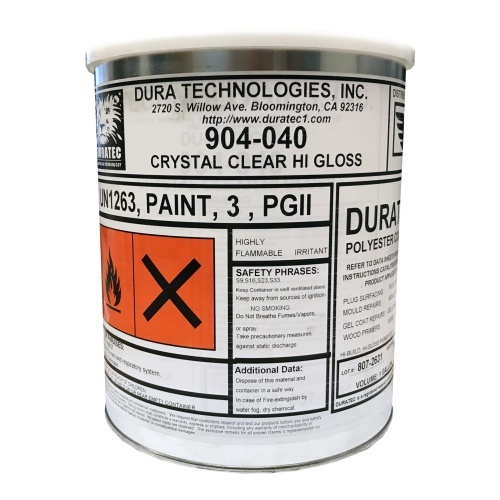 Also used for gelcoat repair applications and for upgrading tooling gelcoats. · Easy to apply—the coatings build quickly and spray easily. You'll save time and labour. · High gloss—sand and polish to a non-wax, tack-free high gloss finish. · Stability—the coatings offer clarity (clear), colour (pigmented) and light stability. · Superior finish—the coatings produce a hard, chemical-resistant finish. Measured at 25°C (77°F) at the time of manufacture.